Set in the heart of the Dordogne this secluded B&B offers complete tranquility and makes a perfect setting for a peaceful holiday, or, as a base for all the local French tourist attractions. 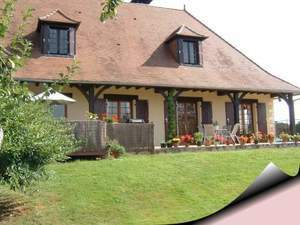 Set in the heart of the Dordogne this secluded B&B offers complete tranquility and makes a perfect setting for a peaceful holiday, or, as a base for all the local French tourist attractions. The ancient town of Perigueux, which is the capital of the region, is just 40 minutes and is steeped in history going back to Roman times. For the china and porcelain enthusiasts, Limoges china outlets at Saint Yrieix la Perche are just a 20 minute drive. The Dordogne is renowned for it's beautiful countryside with lots of marked routes for walking, cycling or horse riding and there are plenty of attractions to visit. If its just a chilling out holiday you want then you can relax by the pool under a shady umbrella and enjoy the peace and quiet that the garden offers. The house has plenty parking and is ideally situated to use as a base for those of you house hunting. We also offer reasonably priced storage facilities for your furniture should you require it. Continental breakfast is included in the price and consists of fruit juice, cereals, yoghurt, freshly warmed croissants with home made jams or locally produced honey, tea/coffee or hot chocolate and a selection of seasonal fruit from the garden and local market .